So there are some materials that you need to Ascend that aren't the figurines. So I've complied a list of them. Since I don't have pictures of some of these items and they're pretty ambiguous there might be mistakes. I'll correct them and add pictures when I can. So you all know that the list was leaked. But I don't really trust that tumblr guy so I did it myself. It's arranged by artist. Also there's a link next to each artist to get a sample of that person's work. GO You! - Class Skills Actually Do Something? So the Class Skills in Grand Order and a bit different. Mcjon's theory is that any passive skill is included as a "Class Skill." So let's say you have an Assassin, and it has Magic Resistance. Normally that Magic Resistance would be a Personal Skill, but here, it's a Class Skill. Furthermore, stuff like Divinity is passive in this game, therefore, it is a Class Skill. GO You! - What Does My Noble Phantasm Actually Do? So I'm sure most people on BL playing Grand Order basically knows what happens when they use their NP. However, they might miss a lot and you're not sure why, etc. Well I'm going to go through some NPs here. I'm just going to go down my friend list because I don't really want to go through the Grand Order thread again. But if you have a request, I might be able to get to it? Posting in my blog because everything is just getting lost in the GO thread. So there's a common concept in mobage which is you run something call daily dungeons/quests. And in these quests you can get different material on a different day. 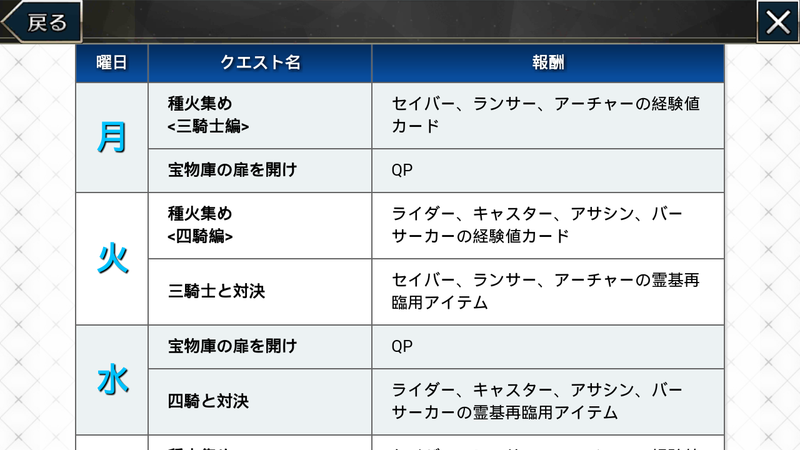 This is a list for what you can get each day for Grand Order. The second column is the name of the quest. You will find them in the Chaldea Gate from the main menu.